The trip is going well. Started off exceptionally well with a points upgrade, which Anne Marie put to good use. After two glasses of ‘Charles Heidsieck’ off to bed for a 7 hour sleep ! love those pyjamas !! 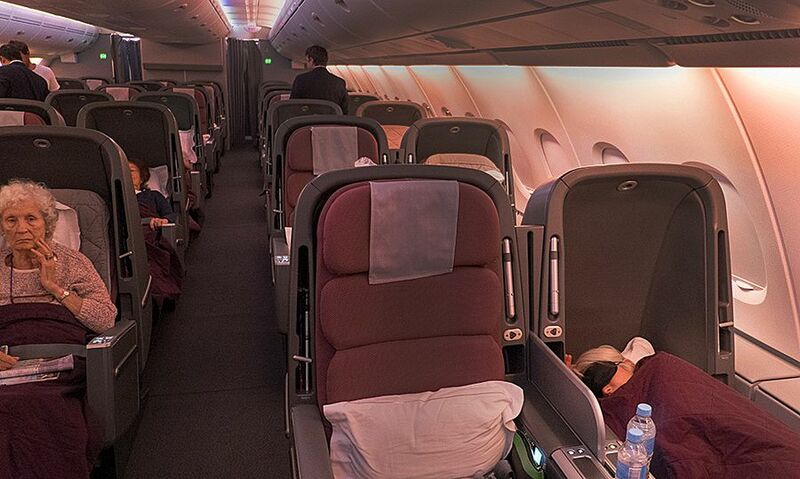 The pointy end only way to go on a 15 hour flight ! Also very comfortable for working…between us we transcribed and did the first edit of the interview with Bob. Quick stop in Dubai just to get out – go through security and get back on the plane – but good to stretch the legs ! Next leg Duval-Leroy …and before we knew it we were landing in Heathrow – kindly picked up by Patrick Eagar and off on the M4 to Richmond. 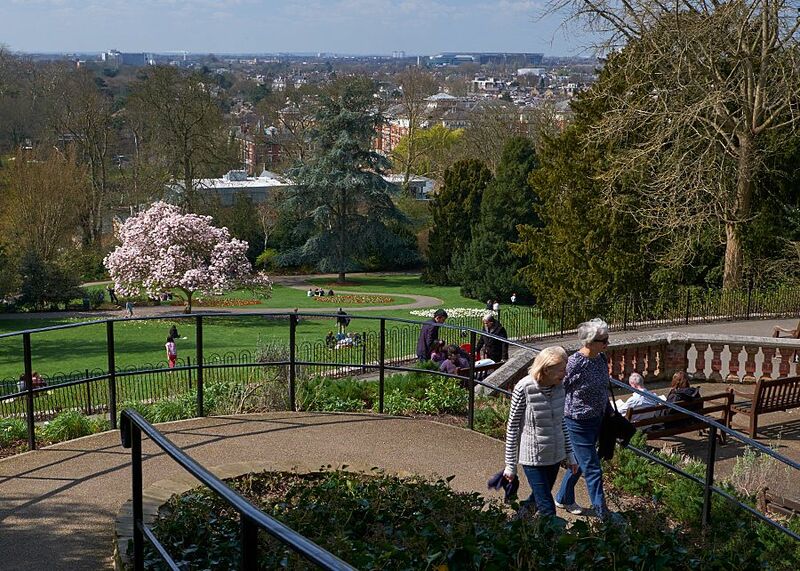 Great to catch up with Patrick and Caroline…a walk around historic Richmond in sunny British weather, local wild dear as well, and time to enjoy a warm beer at the Cricketers with a view over the Green. The deer in Richmond Common. Next day walk along the Thames – morning tea at Petersham Nurseries – made famous by chef Syke Gyngell then walk back through Richmond Park with famous ‘Turner’esque views and the stomping ground of Henry the 8th where he was believed to have gone for horse rides while wives were beheaded in London. A great walk with Patrick and Caroline in Richmond Common. Back to Patrick’s for a very sunny lunch and the first outing of the outdoor chairs for the spring season. The Richmond backyard of patrick and Caroline. Amazing mushroom soup made even more special by sharing a tipple of Fino sherry from John Arlott’s cellar. Fino from John Arlott’s cellar. 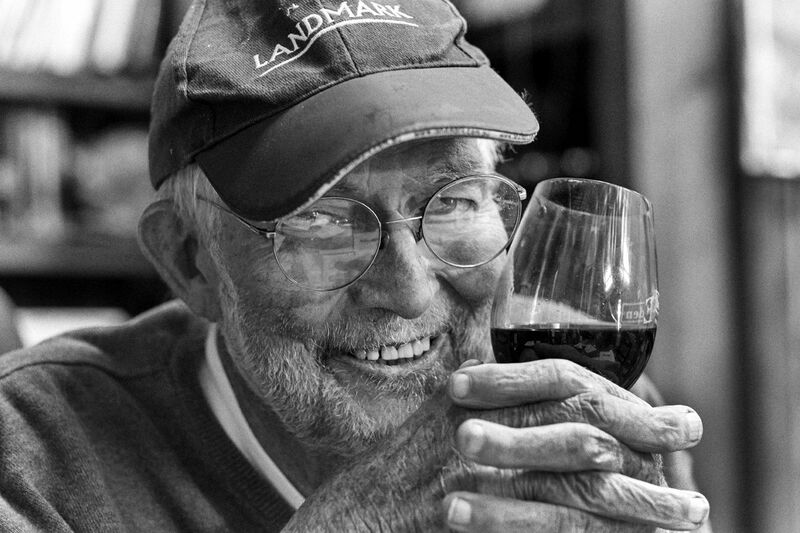 Cricket tragics will probably know of John – he was a commentator with the BBC and also a wine connoisseur. 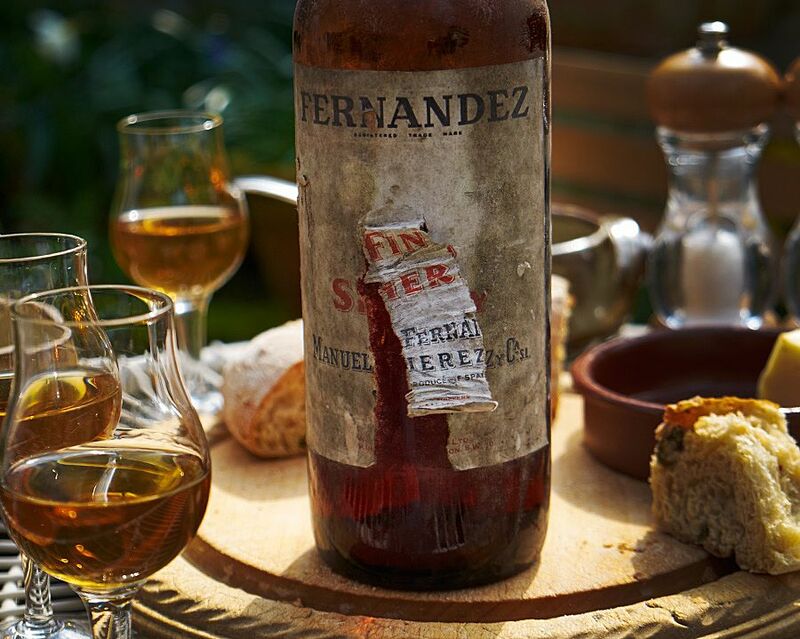 Patrick had the pleasure of clearing out John’s cellar when he moved to the Channel Islands and discovered that he would have to pay tariff to take all his own wines ….the sherry held up very well ! Next day, Milt followed up on invitation to Hedonism Wines. Head of Buying Alistair Viner showed us around. Loved the book, took it on consignment. Thank you Alistair. That’s Alistair in the middle with his back to us. 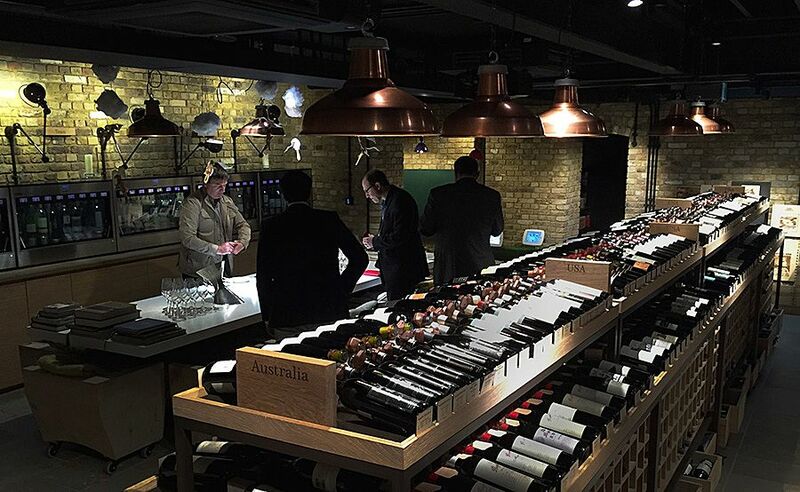 Hedonism the most amazing wine shop we have seen. Fantastic bit of niche marketing, sensational range of wines – could we be tempted by the bottle of Salon in AMs birth year ? just 10,025 pounds ….anyway we enjoyed being voyeurs – and would have been very happy to move in ! Not only a complete collection of Grange, many signed by Max Schubert. 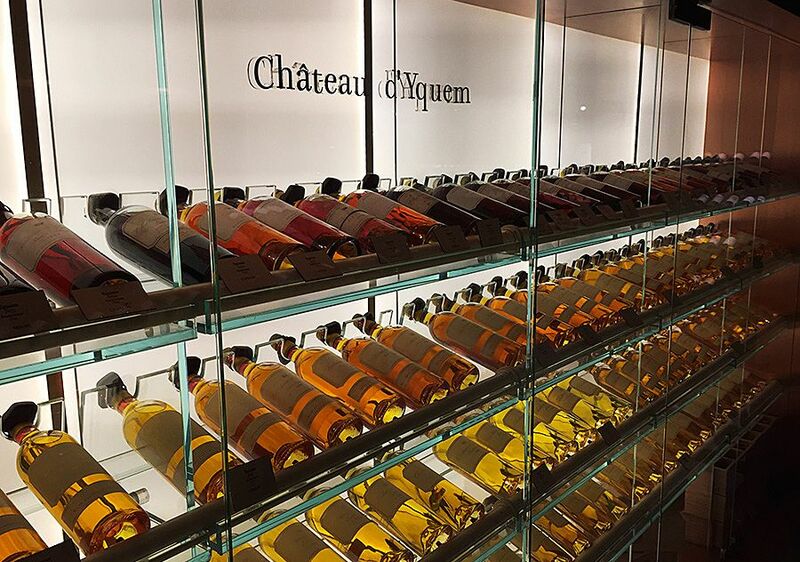 The biggest collection of Chateau d’Yquem. The whole collection was amazing especially the vault. Alistair arranged for Clayton Smith and Aussie from Sydney to open it for us. 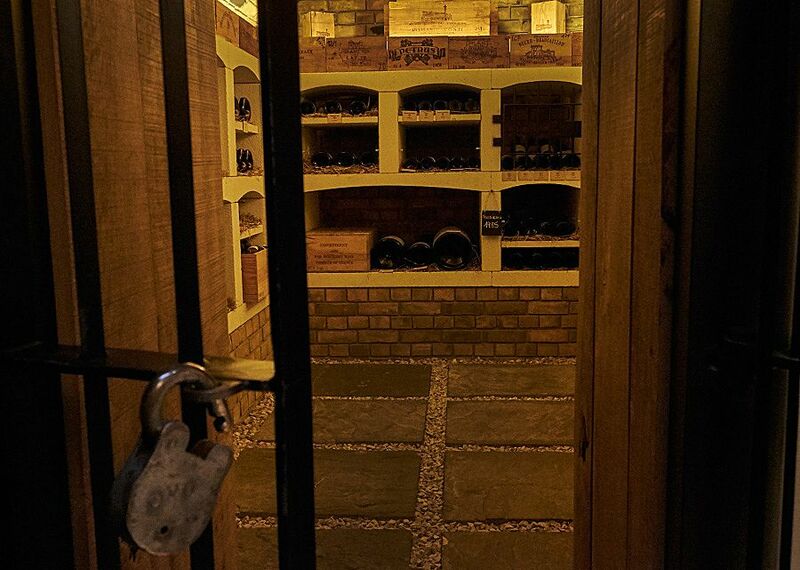 The Hedonist vault, where Anne marie found the 1964 Salon. Cheap at 22,000 pounds stirling ! Lunch at Nopi – Yotam Ottalenghi’s restaurant with Patrick, Caroline and Charmaine – everything delicious and fresh – gorgeous flavours – highly recommend it. Up to Wednesday…. back to London to cement different memories of the British Museum – for all who have heard that story of a Christmas Eve some time ago will know what we mean…. then foolishly tried to go to Natural History Museum in the school holidays !!!! – fruitless journey we will be better prepared next time. 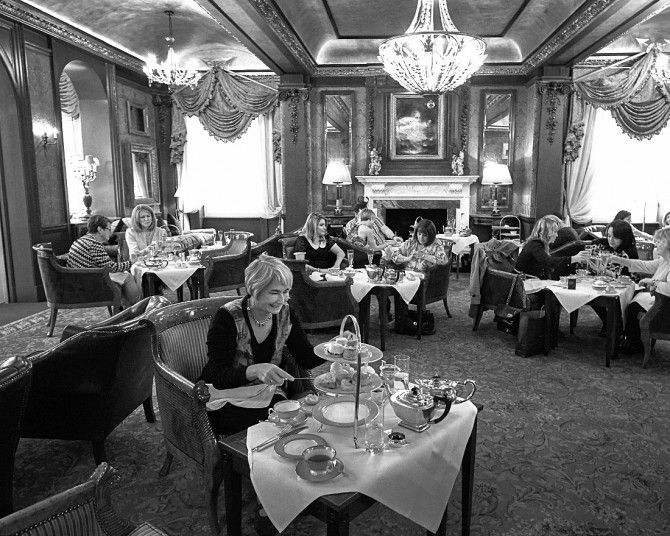 For the afternoon – very British experience of High tea at the Goring – Glass of Bollinger – fancy sandwiches, exquisite tea…fine china great way to spend the afternoon. 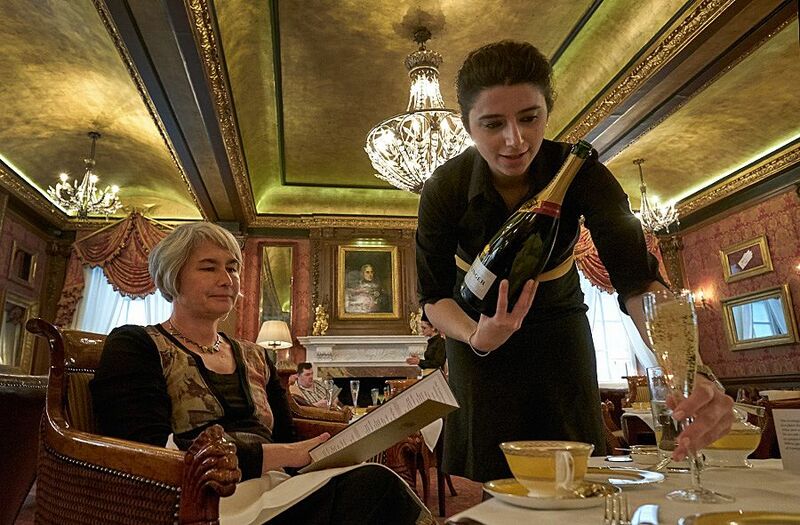 Bollinger with that tea anyone ? It’s only 62 pounds @ head ! 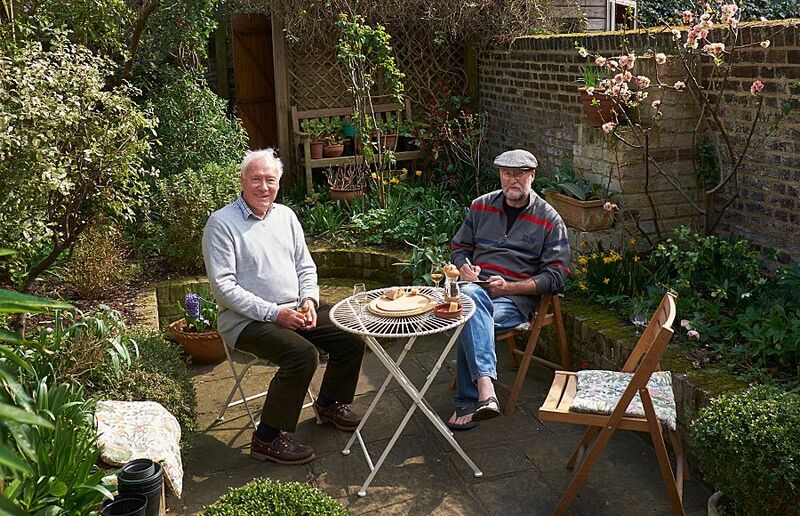 Then using the brilliant public transport system to Charmaine and Ants near Wimbledon – for a magnificent meal, wine and cheese….Milt interviewed Ant for the book and then we caught the bus back to Richmond… too easy. 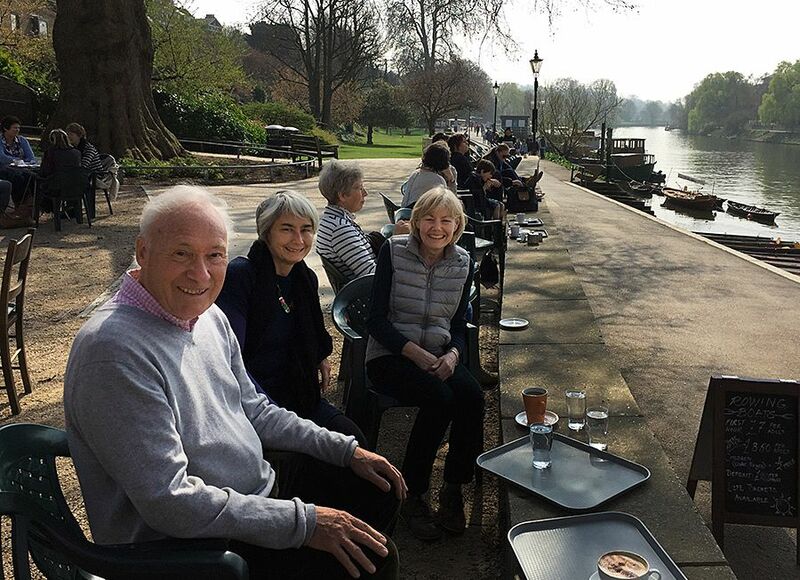 Thanks so much to Patrick and Caroline for sharing their little bit of Richmond paradise with us, a quick cuppa on the banks of the Thames in Richmond – and so to Spain. The Thames flows through Richmond. Back of the bus again – and to make matters worse… due to Paris air traffic control strike 90 minutes on the tarmac before taking off for Madrid….. the joys of travel…. Madrid airport very grand architecture …. walk…. short train ride…. walk all still in the airport before we get into taxi to Sam’s place…. thing is when Sam texted his address to Milt the phone took out the ‘n’ which confused the taxi driver who was determined to be confused anyway…. put us out on the wrong street – which we didn’t realise at the time and we went in to another number five – up to another level 3…… and found ourselves at a hostel….. back down again – quick call to Sam…and luckily we were just 5 minutes away so were very relieved to see Sam and Bea coming up Calle Mayor to greet us. 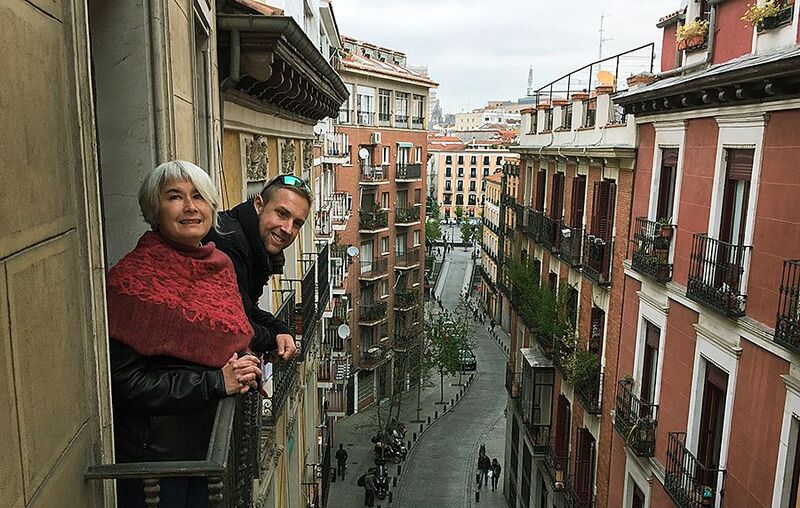 Sam and Bea’s current apartment is right in the old area of Madrid – near the Opera House and Sol. The veranda at the new joint. It is palatial and we enjoyed some great jamon, manchego and a Rioja for supper before going out for a drink. Shared a celebratory bottle of Cava at the local Mercado. They are blessed to have such a great area on their doorstep… the next day we did some more exploring…. were ultra impressed with Sam’s fluency in Spanish and had our first peek at the new apartment – even closer to Opera and while the apartment is definitely in need of some love …and some demolition…. the building is very well maintained and has enormous potential. Then a beer at a trendy rooftop bar in Cuerca followed by traditional lunch at a ‘communista’ for albonicas, and fabada…home for a siesta !!! 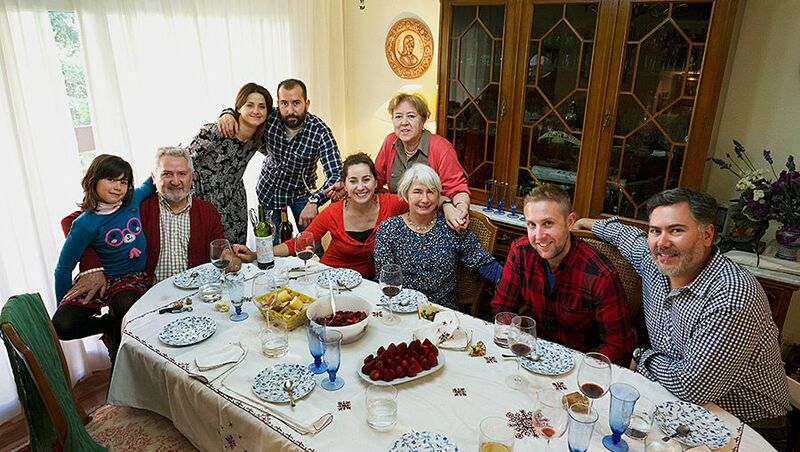 Anne Marie with Bea and Sam’s Spanish Family. An absolute highlight has been meeting Pilar and Ventura – Bea’s mum and dad and her brothers Carlos and Janhvier, Carlos daughter Aidi and Janhvier’s partner Rebecca. We enjoyed a traditional Saturday family meal – amazing lamb… and really felt the love in the household. 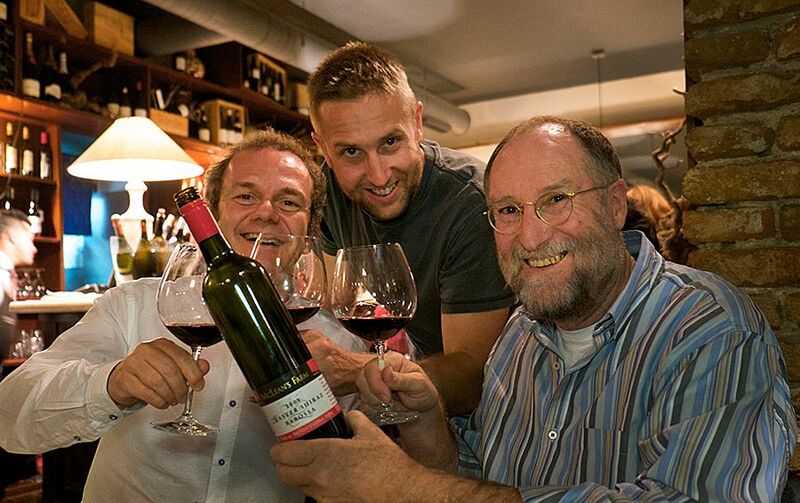 Ventura shared a bottle of Vega Sicilia 2004 which we all agreed was like the Spanish Grange … very special. After lunch we sat with Ventura and Pilar planning our next trip to Spain and our next…. 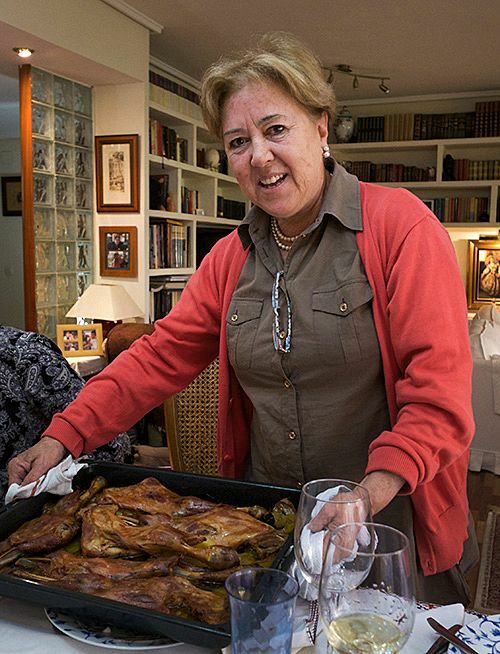 We’ve just come back from midmorning crawl through some of the most crowded markets – which built our appetite for a traditional lunch menu at one of Sam’s mates’ restaurants – Tercio viejo de Sarmiento. Juan was an excellent host and food was great. Paella, cocido……..A much needed long walk – with less crowds through the Rivera Park to the genteel area around Goya was next….to meet the architects that Sam and Bea are working with for their apartment – they specialise in working with small places – and so were impressed when Milt mentioned the dimensions of our house before the renovation ! We left them to it and braved the Madrid metro back to Opera subway station, just upon the lane from Sam and Bea’s place in downtown Madrid. As you know our good friend Big Bob McLean passed away last week. Big Bob at home Wednesday April 1st. Milt did an interview with him for the blog just before we left. Bob let on he may not be with us when we got back. To use the Bob’s last words he said to Milt as he left. Just in case he was correct we took a bottle of Bob’s McLeans Farm, 2008 Master Shiraz with us to share with someone we met along the way who knew him. Only took a few days in Madrid to find Luis Pryde Aguilar. Luis is an Australian journalist and one time importer of Australia wine into Spain. The first label he took on was St Hallett after tasting ‘Old Block’ with his brother one Christmas in Luxembourg. Thats’ him below with Sam and I at Taberneros Wine bar and restaurant. The food was fantastic.